Neoware president and CEO Michael Kantrowitz says existing IBM thin clients can be upgraded with new operating systems. IBM Corp., inventor of the PC, will continue to develop its NetVista line and to support its PC customers, but the company has turned over its PC manufacturing to Sanmina-SCI Corp. of San Jose, Calif., under a three-year, $5 billion outsourcing agreement. Fran O'Sullivan, general manager of IBM's personal computing unit, said outsourcing the manufacturing of other PCs will cut IBM's costs and let the company concentrate on design, marketing and product support, O'Sullivan said. The NetVista machines will still carry the IBM brand. 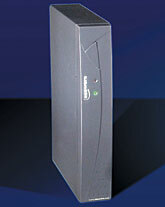 The NetVista M series use Intel Pentium 4 processors and an embedded security subsystem. The A series allows a choice of Intel Celeron or Pentium processors, and the small-footprint X series has integrated flat-panel monitors. IBM will continue to assemble its ThinkPad notebook PCs for the U.S. market in Guadalajara, Mexico, O'Sullivan said. In a related move, IBM is licensing its NetVista line of thin clients to another thin-client manufacturer, Neoware Systems Inc. of King of Prussia, Pa. Neoware will offer to upgrade existing IBM thin clients with Neoware's Eon software, Neoware president and chief executive officer Michael Kantrowitz said. Although IBM will discontinue manufacturing its own thin clients, Neoware owners can get IBM service and support. IBM thin clients run only Linux, but Neoware will offer devices with Microsoft Windows CE or Windows NT embedded operating systems as well as Linux, Kantrowitz said. The thin-client market has never materialized for IBM, O'Sullivan said. Also, the price difference between thin clients and standalone PCs turned out to be less than expected. Government agencies and health care providers are the primary buyers of thin clients because the architecture reduces operating expenses and increases security, Kantrowitz said.